Dean Hammond has refused to rule out the possibility of joining Sheffield United on a permanent basis this summer. The midfielder, who arrived on loan earlier this season from Premier League title favourites Leicester City, will become a free agent this summer when his contract at the King Power Stadium expires. 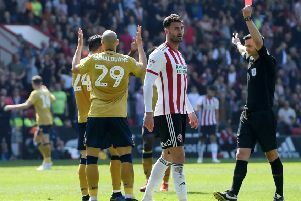 Blades boss Nigel Adkins, who worked with Hammond at Southampton as they went from League One to the Premier League in successive seasons, is a vocal advocate of the 33-year-old’s attributes on and off the field. And, speaking ahead of this afternoon’s visit to fifth-placed Millwall, Hammond said: “All I’m focusing on is the final ten games of the season, right now. “I enjoy playing for a club of this size... it’s a challenge but it’s one that I enjoy. “I’ll keep trying to improve, and help the team reach its target for the season. I keep myself fit and in good shape, I work hard on that, so I think I’ve still got a good few years left in me. United travel to The Den 11th in League One, six points behind sixth-placed Bradford City.